My local TV station called and asked to interview me about the HALL OF HEROES comic book club at school. They did a great job. I was particularly proud of my two students they interviewed. One is not, by his own admission, a fan of reading. Comics have changed that. The other is a voracious read who reads comics and traditional novels every day. Notice that the boy who says he does not like reading often wants to skip recess so he can finish his comic. There is nothing more telling than that. I was also proud that one talked about reading the pictures and reading slowly. I always tell my kids that comics are not designed to be read fast. They are to be enjoyed and absorbed and read slowly, pausing to take in all the visual details and queues. Just goes to show you that comics are not only bridges to reading other things but are legitimate literature pieces worthy of academic study in themselves. My desktop was struck by a power surge two nights ago. I cannot access my ready-for-publication reviews at the present moment. You would think that a technology teacher would back up his files. I do back up my school stuff, but never added TGC. That will change very soon, I assure you. So no reviews this week. Keep reading and teaching and showing kids that literature of all types is a beautiful thing. MakeBeliefsComix.com is sponsoring a comic strip contest as part of its efforts to encourage students enrolled in literacy and English as Second Language programs to develop their language, writing and reading skills. Each month students can submit by email their best comics created at the free online comic strip generator. Comics can be on any theme the student chooses. A selection will be posted periodically on the MakeBeliefsComix Facebook Wall and the winner of the best comic will receive a free book written by Bill Zimmerman, the creator of MakeBeliefsComix.com. His books are used by educators to help students discover their writers’ voices and express what’s hidden within them. They include: MakeBeliefs: A Gift for Your Imagination; Pocket Doodles for Young Artists and Your Life in Comics: 100 Things for Guys to Write and Draw. Contest rules: Classroom collaborative and individual submissions are encouraged each month. Books can be delivered to U.S. addresses only and winners will be notified via email. Winners under the age of 16 will be required to have an adult in the family or school provide the address for book delivery. Comic strips created on the site should be sent to WmZ@aol.com, the email address of Bill Zimmerman. Since MakeBeliefsComix.com was launched four years ago, over 2 million people from 175 countries have visited this free educational resource. Google and UNESCO named MakeBeliefsComix as among the world's most innovative web sites that encourage reading and literacy, and Parents' Choice Foundation gave it the Recommended Award. This year the American Library Association selected MakeBeliefsComix for its annual ‘’Great Web Sites for Kids ’’ listing. The site offers 80 different characters, blank talk and thought balloons to be filled in with text, story prompts and printables, and accepts text in English, Spanish, French, Italian, Portuguese and Latin. Comics created can be printed and emailed. The educational online comic strip site also has added another feature that enables users to post their comic strips on their very own Facebook walls to share with friends and family. I was thinking how stressed out so many teachers are at the start of the year and thought it might be fun to recommend a few comic books for teachers (but still appropriate for students): MR. LOWE by Mark Pett and SHELDON: LITERARTURE by Dave Kellett. While I was at it, why not make it in the form of a webcomic? I was one of those kids who found history exceptionally boring and history classes excruciatingly painful, mostly because history seemed irrelevant to my life: dates, names, memorization, tests, blech. On the other hand, I really enjoy The History Channel and Discovery because those channels make history, mystery, and science so interesting … engaging … and relevant. Those shows make me want to sit and listen and learn just for the heck of it. I will not make that mistake again. 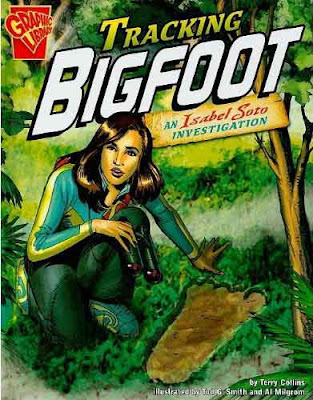 I choose to read and review TRACKING BIGFOOT because I thought this title would capture student minds; it caught mine. Archeologist and historian Dr. Isabel Soto narrates the series. Dr. Soto uses her Worldwide Inter-dimensional Space-time Portal (WISP) to scientifically investigate legends, defunct cultures, historical events, and scientific phenomena. She interviews experts, examines the evidence (or lack thereof), and formulates hypotheses. All of this is constructed using a fictional narrative structure. In other words, she conveys the nonfiction information in a fictional story format rather than just pages of information. What are her findings in TRACKING BIGFOOT? She concludes that some evidence is manufactured in an attempt to misguide the public, while other evidence is compelling but inconclusive … for now. There is hair evidence that cannot be identified as belonging to any other species, a fact which kids will find compelling and intriguing. I like this series because of what it does for nonfiction readers. However, I am unsure as to how most traditional nonfiction-loving students will react to the fiction-like aspect of the series. I find it very compelling and I suspect they will as well. The art is not dumbed down for the young audience for which it is intended. 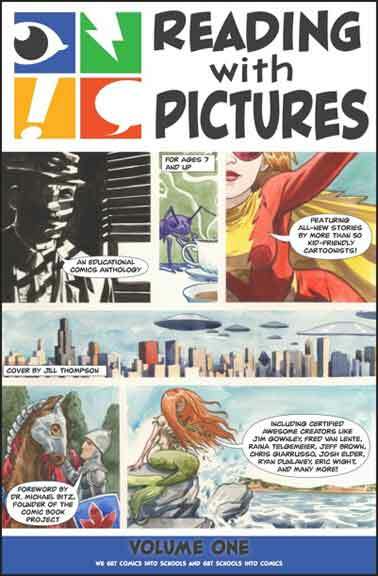 Tod G. Smith and Al Milgrom illustrated the book using standard American comics realism with approximately four uncluttered panels per page. No worries. This text is very appropriate for students. First of all, because this series is leveled, it makes it easy for teachers to use it with the right reading group or individualized reading program that may be used for struggling readers. 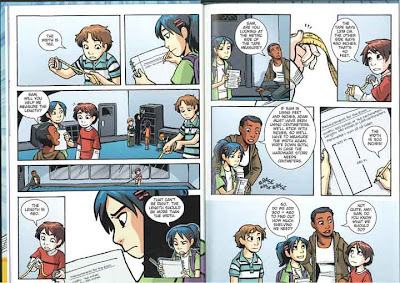 It has an AR Quiz associated with it, meaning schools that use the AR quiz program to track reading can offer this comic as part of the curriculum. Beyond the reading specifics, this book is an important piece of comic literature as it is nonfiction, a genre that has traditionally been lacking in the comics industry (and in our reviews), but is steadily gaining ground. Studies show that boys are more interested in nonfiction and sports. On the book page of the publisher’s website, teachers can select their state from a pull down menu to see the state standards correlating to this book, making curriculum inclusion seamless and beyond reproach. Drawing conclusions is a large part of standardized testing and this series is perfect for reading, analyzing data and drawing a conclusion based on the evidence making it ideal for the classroom. I envision a classroom of five to six cooperative groups where each group is made up of 4 students per group. Each group would include students of various reading levels (Below Basic, Basic, Proficient and Advanced). Each team studies their area of interest and creates a wiki, Power Point, Glog, Prezi, poster, newspaper, magazine article, or other such culminating event and then presents that information to the rest of the class including that group's conclusions. Additional books, comics, newspaper articles, videos, artifacts, websites or other resoucres could be used to enhance the learning and perspective for each subject level. It would require a good deal of up-front work on the part of the teacher, but once the resources are collected, the students are the ones who research, investigate, analyze, draw conclusions and do all of the work. 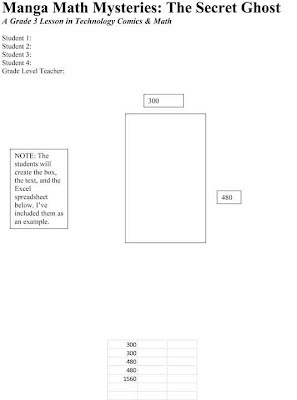 This approach is authentic and allows the students to study their area of interest and creates motivation. I have found it to be very engaging in my own classroom. I am not sure what it is, but I know I like it. READING WITH PICTURES, the anthology, arrived in my mailbox a little over a week ago. I was reading a textbook on teaching comics in the middle school and high school classroom at the time and I had to finish it first before picking up RWP. I am a little neurotic like that. I used every free moment, of which I have few, to finish that textbook on Friday of Labor Day weekend. Despite the nice weather and the incredible urge to hop on the Harley and take a leisurely ride across the countryside of Southwest Missouri, I sat and read and reviewed my hardcover anthology. I am almost at odds with myself on how to properly categorize READING WITH PICTURES. It is part comics history lesson, part defense of comics in the classroom, part story, and part science curriculum in comics form. It’s sprinkled with jabs at traditional teaching techniques (stickers for motivation and knuckle-busting rulers), educational pedagogy and strategies (I thought the comic on onomatopoeia would be pitch perfect for the elementary classroom), and stories promoting libraries and literacy. READING WITH PICTURES is, above all things, a comic. 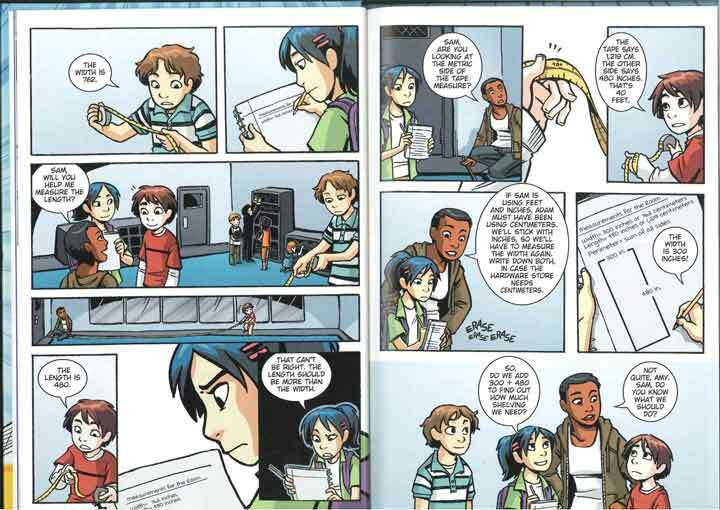 It uses various art forms: American comics, manga, extraordinarily cartoony and rich realism. The anthology is humorous and serious and educational and academic and with all this it is still elusively indescribable. I loved it –– a lot. I already have plans to use some of its chapters in my classroom and have suggestions for a high school science teacher friend. That makes it highly recommended in my mind. The anthology is recommended for ages 7 and older and is an excellent compliment to the classroom if not for its educational contributions, information, and pedagogy, then for its uniqueness and the financial benefits for the organization that published it. Consider the purchase of RWP your contribution to the comics-in-education movement and the research that will be produced because of it. I thought the book(s) were a little bit confusing, but a great series. For instance, G-Man’s color-changing friend. It may be depending on his mood. Or that may be his way of blending in. Or it could be just what he does. I still haven’t figured that out, yet! 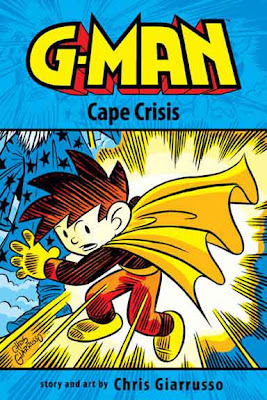 Other than that, great books, great series because of the interesting problems that G-Man’s in. It just alarms me what happens in the story because the book tells you over and over. So, incredible book, fantastic series! I think the art is completely incredible because it shows if you fly or not. It shows the reaction on people’s faces when they see someone flying! If the art shows two people mainly in the panels, it shows not just them, but also other people and their reaction to what’s going on mainly in the story. TOON Books, a favorite comics publisher for emergent readers, joined another publisher and will, as of October, operate as an imprint of Candlewick Press. The award-winning titles will be distributed by Candlewick and the Random House network. Candlewick will bring on board TOON's acclaimed backlist, including 2010 Theodor Seuss Geisel Award winner Benny and Penny in the Big No-No! by Geoffrey Hayes; two Theodor Seuss Geisel Honor Books: Little Mouse Gets Ready by Jeff Smith and Stinky by Eleanor Davis; and eight additional TOON Books favorites. The new imprint will publish four to five new titles each year. In spring 2011, TOON will release Silly Lilly in What Will I Be Today? by Agnès Rosenstiehl, and Patrick in A Teddy Bear’s Picnic and Other Stories by Geoffrey Hayes. 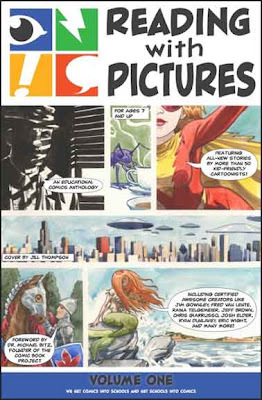 Peter Gutiérrez, who has written for The Graphic Classroom before, has a nice article on Dr. Rick's Blog about comics literacy and read-alouds, and I could not pass up the chance to promote it. The best part of this article is that it is the first in a series on how to properly use comics as classroom read-alouds. I can't wait for the next installment. Indeed, it’s this rich connection that enables graphic narratives to provide unique ways of building literacy skills. Yet we can’t reinforce all these skills by the sheer act of reading a comic or graphic novel aloud. The realization of the full literacy benefits requires some facilitative strategies that are specific to comics. In my next post I’ll cover some of these in detail, now that I’ve provided, if not a rationale then at least a fervent pitch for why you should include comics in your kids’ reading mix in the first place. It's those specific strategies and approaches that teachers need in order to effectively integrate comics into the classroom and increase student learning, which is after all the top priority of any educator. This is a must-read series. Capstone is previewing its newest titles for fall from favorite imprints Capstone Press, Compass Point Books, Picture Window Books, and Stone Arch Books in a free webinar. They offer a lot of comics and graphic novels for schools. Hot topics. Accessible text. Engaging design. These are just some of the qualities that make Capstone titles indispensible for a library collection! This free, 30-minute webinar will hit all the high points from favorite Capstone imprints, giving attendees the scoop on new titles that will thrill their readers and support their curriculum! Attendees of the live webinar are eligible to win a free Skype™ visit from Michael Dahl, author of more than 200 children’s books! Michael will offer an exciting online visit perfect for school-aged readers. Attendees will also receive 1,500 bonus points (the equivalent of one free book) credited to their Capstone Rewards account, a free program allowing members to earn points toward free books with every Capstone purchase. The webinar will give details on Capstone’s new budget-stretching Pay Yourself Forward fall promotion that offers Capstone Rewards members up to 30 percent more books completely free! Attendees not already enrolled in the free program can sign up at www.CapstoneRewards.com. The webinar will be archived and available online after the live event. Register online at https://www2.gotomeeting.com/register/442014027 and be alerted when the recorded version is available. 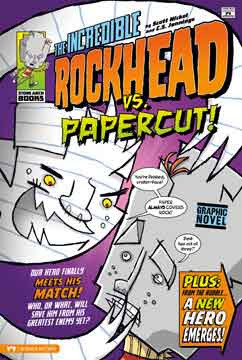 THE INCREDIBLE ROCKHEAD VS. PAPERCUT is the third in a series of ROCKHEAD books put out by Stone Arch Books. Visually appealing, the books are a bit light on story and character development. In this edition, the superhero Rockhead –– the alias of nerdy Chip Stone –– must do battle in the school cafeteria against Papercut, formerly the school bully known as Troy Perkins. There’s a back story of a villain named The General out to get Rockhead by helping to create Papercut, but that’s not really all that important. Instead, think of the playground game of rock-paper-scissors, where paper covers rock, and soon enough Rockhead is in trouble. That’s the plot by writer Scott Nickel (who works by day at Paws Inc., the studio of Garfield’s Jim Davis). What saves the day? Scissors, of course, because scissors cut paper. So Chip’s friend, Spencer, transforms himself into Scissorlegz to save Rockhead, and the story is over in a flash. It’s the art by C.S. Jennings that will get this book into the hands of your students, particularly those who are amused and entertained by superhero comics. THE INCREDIBLE ROCKHEAD VS. PAPERCUT is designed to look and feel like a classic superhero comic, complete with a fake advertisement, a fake cover, and more. The art is playful, colorful, and oversized. The covers of the ROCKHEAD books are no doubt what will attract the attention of your students. Like most of the Stone Arch books, there is a handy glossary at the back of the novel for the difficult vocabulary thrown into the story. And they’ve kept the playful theme of the book intact, making the vocabulary words “…brought to you by The General’s nerdy sidekick …” There is also a series of writing prompts, which come in the form of a goofy newscaster for K-ROC News 5, and readers will no doubt chuckle with the villain, Papercut, interrupts the newscast. I wish this book had more substance to the story and characters so that I could make a better recommendation for the elementary classroom. Middle school readers would be bored, I think. I recommend it, but not very highly. Given the budget constraints of most teachers, I would suggest putting your library dollars elsewhere. But if you have any of the ROCKHEAD books given to you, put them out and I suspect they will get read. Read quickly, perhaps, but still, read. 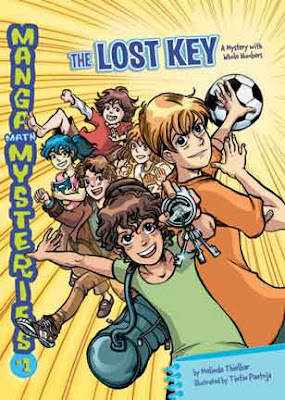 Last year Lerner Publishing Group sent me their new math-inspired manga series intended for grades 3-5. Rather than writing a traditional review, I decided to test the books out and write about the experience. I choose MANGA MATH MYSTERIES #3: THE SECRET GHOST and wrote my own technology-based lesson plan for my 100 third graders. Several students are taking martial arts classes. The instructor needs to hang shelving on all four walls of the dojo to store equipment and the students agree to help Sifu. First, they have to figure out the perimeter of the room in order to know how much shelving to purchase. The second half of the story focused on an old ghost story, perimeter and secret rooms. I chose to only use the first half of the perimeter story only because of time constraints. 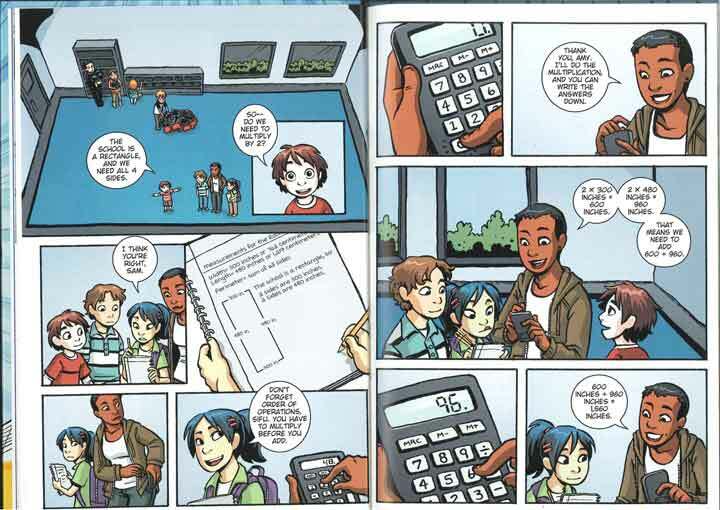 I read the comic first and then consulted Missouri’s Grade Level Expectations (state standards) for grade 3 mathematics. I wanted to establish my standards before ever creating any lessons or activities, to ensure that the standards were the foundation for my unit. M1A: Understand measurable attributes of objects and the units, systems and processes of measurement. Determine unit of measurement. Identify, justify and use the appropriate unite of measure (linear, time, weight). M2A: Apply appropriate techniques, tools and formulas to determine measurements. Use standard or non-standard measurement. Use a referent for measures to make comparisons and estimates. Once established, I carved out the activities. R1Fd: Apply pre-reading strategies to aid comprehension: set a purpose. R1Hc: Apply post-reading skills to demonstrate comprehension of text: make predictions. R1Hf: Apply post-reading skills to demonstrate comprehension of text: draw conclusions. R1Hg: Apply post-reading skills to demonstrate comprehension of text: analyze. Even though I have a computer for every child, I did not use the one-to-one ratio at all times. I introduced the idea of perimeter (without defining it or using the actual word, yet) and then we explored what cooperative groups are and how they behave emphasizing the need for self-control and respect of all group members. I then broke students into heterogeneous cooperative groups (3-5 students per group) so each group had students of varying reading abilities and genders. I have two seating arrangements when using cooperative groups. When at their computers, all group members are seated in close proximity so they may actively share as each works individually. I also have students sit in discussion groups, where the group’s chairs are pulled away from the computers and are arranged in a tight circle. I then emphasize that no group members are to be left out and every student has a job in the group. Using the document camera, we then read the book together stopping at page 13. The students in the story measured the room and – after some problems mixing standard and metric – discovered the room is 480 inches long and 300 inches wide. “So do we add 300 + 480 to find out how much shelving we need?” asked Amy. Amy, like many students, has the misconception that adding the length and width will give a student the perimeter of a room. Her misunderstanding gives students the chance to safely confront their own misconceptions because they are not the only ones who were confused. We did discuss why some approaches might not work and why, but it was done respectfully and carefully. Therefore, students understood their misconceptions in a real way and felt confident to learn from their mistakes without feeling criticized. Many students, like Amy in the story, thought we could add 300 to 480. After student discussion we read pages 14-15 in which the students in the story discuss their misunderstandings, what the correct answer is and, more importantly, how they came to discover the right answer. After our discussion, we read to discover the answer to the problem. We discovered that adding 300 + 480 only provided shelving for two walls and not four. That was a big “a ha!” moment for a good number of students, but once they got it, they changed their dry erase boards and I checked for understanding and accuracy in mathematics, as some students used an appropriate mathematics process but got the wrong answer because of math mistakes. We corrected those as well. Again, I recorded most of the information on the Smart Board. After processing and discovering the various appropriate processes to get the correct answer, the students then entered into the technological aspect of the unit. Each student used Microsoft Word to record his or her own approach to solving the perimeter problem. Although students were part of a group, this is where each student became responsible for his or her own learning and demonstrated that learning to me. Students had to use Word to draw a diagram of the dojo and label the length and width of the sides. They also had to list all of their group members and their grade level teacher. Each student bolded his or her name so I knew who I was grading. As students already completed their mathematics, we then used Microsoft Excel (inside of Microsoft Word) to add up each of the four walls. Therefore, students were not only using new technology but also mimicked their mathematics approach a second time. If I saw discrepancies, in any student’s demonstrated approaches, I could asses that the student may not have mastered the skill. Each student was graded on two aspects: group participation and his or her final printed document. 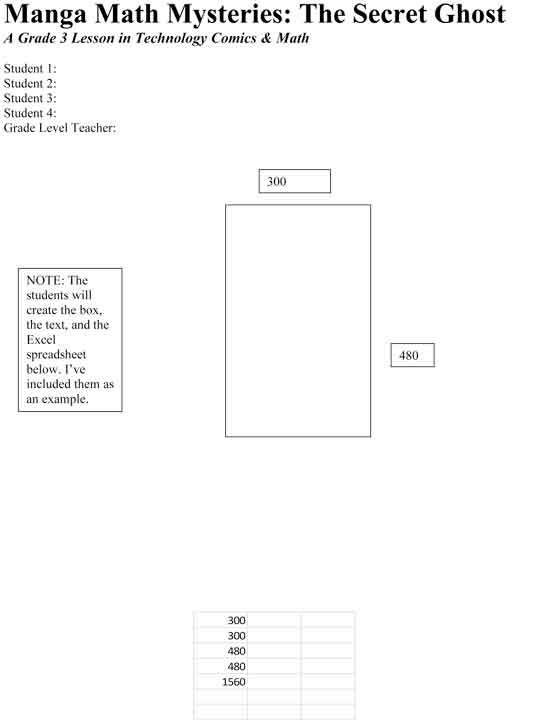 This allowed me to grade students individually even though the majority of their work was done in cooperative groups. It also allowed me to see those students who may not have understood the basic mathematics concepts as they had to duplicate their process on their document. Each group was heterogeneous in reading level and gender. I encouraged discussion among groups so students who understood the mathematics processes taught the students who did not. I also created a video tutorial explaining how to create the document. Those students who were ahead of the class, could teach themselves and work at their own pace without being held up by other students. It is important to show students how to incorporate technology and the learning in their grade level classroom. Students could easily see how they might need to understand perimeter, addition, multiplication and use Microsoft Word and Excel for real world applications. 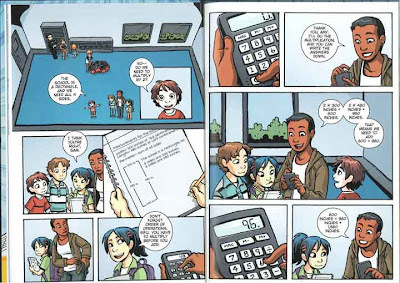 While I might not recommend MANGA MATH MYSTERIES for enjoyment reading for most students, I found it very applicable and engaging to teach required curricula in the classroom. There is an AR Quiz associated with this book. It is listed above. THE SECRET GHOST is also available as a paperback and an e-book. I would consider purchasing the ebook and having students read the book at their own computers.